New S.O.A.P. members, please email [email protected](dot)com with your shipping address so we can get these fragrances out the door and you can start having fun! Thank you to all for Blogging, Tweeting and Facebooking all of about Bramble Berry and S.O.A.P! It was so fun reading about your favorite Bramble Berry product (seriously, I could do that all day, everyday). I wish that everyone could be on the panel but we have a limited amount of fragrances to go around. Since there was so much interest in this panel, we’ll be putting another one together soon (like, in the next 6 weeks!) to test some fall/summer fragrances (think fun and fruity). So keep your eyes peeled for the announcement. Jeanee from Dirty Laundry was on our very first S.O.A.P panel. She tested the fragrances in these mini cupcake bath fizzies (see blog post here). Be sure to check out her blog – we seriously heart her! How do I get to be a S.O.A.P member? Thank you! We have 4 years of soapy related posts (of course, I always toss in personal stuff too – but it’s mostly soap). We love it too! It’s such a fun and new way of interacting with our friends and customers. Oh, yay! I’m so happy and excited to be in such good company with the other soapers in this SOAP panel! Thank you! 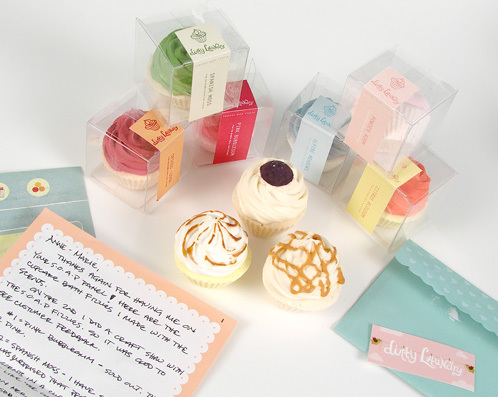 Thanks for the shout out on my cupcake bath fizzies & blog! I wish the new S.O.A.P Members loads of fun. And I ♥ you too Bramble Berry. Congrats everyone! Can’t wait to see what you come up with. Yey, I’m so excited I can hardly stand it! If you need french people to test them… We’re also following ! Congratulations Ladies that is AWESOME… Ya’ll will have a great time and give wonderful feedback! The SOAP panel looks good! Have fun, for sure! Congrats to the S.O.A.P. team! Have fun!